About Us Locations Delivery Financing Pay Online! Email Signup Current Ads Hablamos Espanol- Contactenos! Hi, I'd like to show you this page I found on Wilcox Furniture's website. 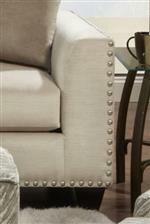 Nailhead trim adds sophistication to this chair and a half. Flared arms and loose back cushions offer contemporary style, while overall the chair and a half showcases bronze and silver tones for a glam vibe. Two large 20-inch pillows add softness and comfort to complete its design. The 1460 Chair and a Half with Flared Arms and Nailhead Trim by Fusion Furniture at Wilcox Furniture in the Corpus Christi, Kingsville, Calallen, Texas area. Product availability may vary. Contact us for the most current availability on this product. Frame Construction A large majority of our frames are constructed with all hardwood. The remaining styles are made of a mixture of hardwood and densified fiberboard, a furniture specific compact plywood alternative. The stress points are reinforced with blocks to secure a long lasting frame. We use the traditional method of nailing frames together for strength and stability. Seat Support We use a sinuous springing system. We reinforce the springs with a 16 gauge border wire to maintain a uniform ride in our seating. We double spring on the ends nearest the arm to give a good balance in the seating. We use approximately 5 springs per seat. Warranty 1 year warranty to original purchaser on all parts. **See warranty tag for details on fabric warranties. Glamorous shades of bronze and silver tones add unique style to this living room collection. The contemporary silhouette of the frame takes on an upscale look with large nail head trim. The 1460 collection is a great option if you are looking for Transitional furniture in the Corpus Christi, Kingsville, Calallen, Texas area. Browse other items in the 1460 collection from Wilcox Furniture in the Corpus Christi, Kingsville, Calallen, Texas area.